(CNN) -- People who go to Daytona Beach, Florida, by car this weekend will probably wish they hadn't -- they'll definitely stand out in a crowd. 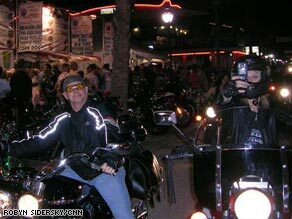 Bobby Mitchell, left, and Sheila Justin enjoy Bike Week in Daytona Beach, Florida. The city is being taken over by half a million motorcycle enthusiasts enjoying Bike Week, which began Friday and will end Sunday. The economy may be in a recession, but bikers aren't passing up the chance to soak up some sun and rev up their engines for a few days in Florida for the biggest motorcycle event in the country. "Every indication we've had so far is that this year's going to be a good one," said Kevin Kilian, senior vice president of the Daytona Beach/Halifax Area Chamber of Commerce. The chamber is the managing arm of the city's involvement in Bike Week, a 10-day event that Kilian said takes an entire year to prepare for. Events like Bike Week and its little brother, Biketoberfest, are what keep Daytona Beach running, Kilian said. With 8.5 million visitors each year, special events bring in about $1.3 billion. The two biker events alone generate $650 million of that, he said. The festival didn't always pack in a half-million people, though. In 1988, said Paul Crow, the Daytona Beach police chief at the time, the event had morphed into something very different from what it was when it started. He said he had to battle what he called "the 1 percent problem" -- the small group of gangs whose viciousness and threats against outsiders had allowed them to take over Bike Week. He decided he wouldn't have any more of their troublemaking, Crow said, so he created a task force that evolved into the office of special investigations for the Daytona Beach Police. Its specific purpose was to deal with the problem. Today, Bike Week has been restored as family-friendly event. The event has even drawn in other nearby Central Florida communities -- including Ormond Beach in the north and Port Orange and New Smyrna in the south -- giving bikers more events to attend and places to go. Bike Week caters to a wide demographic of people. "These are people with a lot of disposable income," Kilian said. "They can afford a $30,000 toy." Factors like the economy and this year's long hard winter probably got people more excited about Bike Week because it's a chance to get away, he said. "Everybody needs a break." Ken Logan, 50, a radio producer from Orlando, Florida, has been going to Bike Week for four years. He said he goes to "keep updated on motorcycle stuff as far as styles, what's done to them, meet people who enjoy bikes, to get patches and all the toy stuff, so to speak, and enjoy other people who enjoy the same thing." The ride from Orlando is only 35 minutes, and he said that's half the fun. "Everybody should go -- whether you have a bike or not -- at least once, just to take it in and see what it's about," Logan said. Bobby Mitchell, 52, also a radio producer in Orlando, grew up in Daytona Beach and has been going to Bike Week his entire life. He said it's been more fun in recent years, though. "It's more fun when you actually have a motorcycle," he said. "You get out there and ride alongside people. You're part of the roar, the noise." Not only is Bike Week becoming more family-friendly, but it's more diverse as well, with more women participants, said Kathleen Tolleson, president and CEO of Roar Motorcycles. There's even a "sisterhood bikeride" in which 35 to 50 women ride together. Daytona Beach-based Roar Motorcycles specifically markets accessories and motorcycles for women. This year, Tolleson said, the company is unveiling a new motorcycle designed by women and made specifically for women and their needs. "It's becoming more culturally acceptable, so more and more women are riding." she said. The bike has a lower seat so that a woman can use her legs and hips when picking the bike off the stand, and can put her feet firmly on the ground when stopped. Most bikes are designed for men, who have more upper body strength and longer limbs. "Women," she said, "need a lower center of gravity." The company is taking orders now, and the bikes will be available in six to nine months.